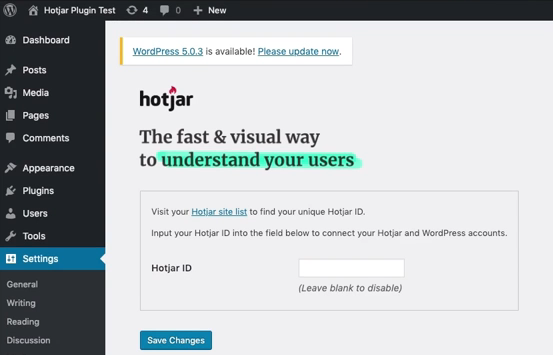 The official Hotjar plugin is only compatible with Wordpress 4.6 or higher. Using the plugin on lower versions will break your site! You can still use Hotjar, but you should instead add the Hotjar tracking code to your header. Select Add New within your Wordpress Plugin menu. This can be found on the left-hand side of the WordPress dashboard. Install the official Hotjar Plugin. After installing the Hotjar Plugin, navigate to "Settings" from your panel on the left-hand side and click on Hotjar from the dropdown. Find your Hotjar Site ID. You can find your Hotjar Site ID once you've clicked on Hotjar Site list (or this link). Copy the Site ID for the site you wish to install the Tracking Code for. The Site ID is the set of numbers next to the Site URL. Paste your Hotjar ID within Wordpress. Go back to your Hotjar Settings in WordPress and add the Site ID into the field Hotjar ID. Once you've saved your changes, you’ll get a notification at the top letting you know that the script was installed. Select “Click here to verify your install” to make sure you’ve installed the tracking code properly. A new tab will open up showing you your website with a notification that reads “Hotjar installation verified”. Remember to backup your WordPress installation before installing any new plugins to your site. To install the tracking code onto your Wordpress theme, one option would be to place it in the header.php file. However, editing the Wordpress theme this way changes the code on your website's local copy of the theme. This means that if the theme is updated or re-downloaded later, you would lose changes to the header and the Hotjar tracking code would no longer be installed. Instead, we suggest using a Script Installation Plugin. Still having trouble installing the code? You can verify the installation manually by following these steps or reach out to our support team below so we can help you!